Jacques Berman Webster, or as you know him from his rapper name, Travis Scott. Born in Houston, Texas, Travis broke into the music world with personally one of my favorite albums, Rodeo. With such tracks as “3500” and “Antidote”, Travis Scott became a household name in the music industry. During his time making music, he has always talked about releasing what he thinks is his best album, Astroworld. On August 3rd, right after his Lollapalooza concert, he dropped it to the world. The first half is very good. Starting with “Stargazing”, it’s a great song to open the album with because it shows how good his production is and how good his rapping skills are. The biggest song that came off this album, “Sicko Mode”, hits us early in the album. The chemistry shown between both Drake and Travis really shows why it is the greatest song off the album. With quotable lyrics and three different instrumentals throughout the song, it is one of the most recognizable songs on the album. The next song that sticks out to me is “Stop Trying to be God”. The instrumental and the way Travis flows on the song makes it a highlight on the album and keeps the listener hooked. “No Bystanders” is one of the most aggressive songs on the album and is personally one of my favorite songs on the album. The lyrics and the drums in the song just come right at you and keep coming at you till the song ends. After the songs “Skeletons” and “Wake Up”, which are very good chill songs, the album takes a dip. The second and third part of the album just do not keep my attention. With forgettable and skippable songs such as “5% Tint”, “NC-17” and “Who? What!”, the only songs that I enjoyed as much as the first part of the album are the songs “Butterfly Effect” and “Coffee Bean”. 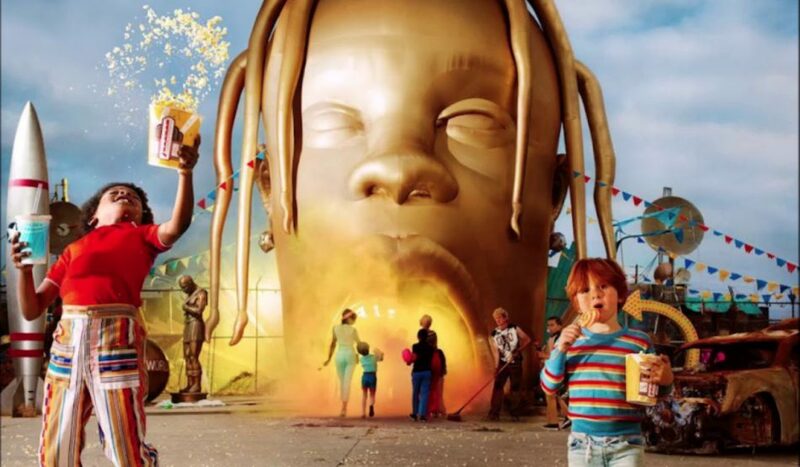 Astroworld has highs and lows, with the highs being some of his best music and his lows being songs that are just skippable songs. As a Travis Scott fan, I would say that this is his second-best album behind Rodeo.